Please pardon the pun — I'm happy to be approved — but a quick search makes me think nobody has said anything about the "startTime" element of Kinja URLs and because I thought an explanation could be helpful, the "joke" kind of wrote itself. I'm sure you've noticed that when you scroll back through any Gawker Media blog, forum or personal Kinja, clicking the "More Stories" button at the bottom of the page appends a "startTime" to the URL and each time you ask for "More Stories", the numbers change. I don't work for Kinja or have access to its code, but clearly the "startTime" is the number of milliseconds since the beginning of the Unix epoch (January 1, 1970 00:00:00 GMT) and it is defined by the timestamp of the last post on that page, with maybe a +1. (I'm not finding a public timestamp on posts down to the millisecond, but if you run the visible time through an epoch converter, you'll get the epoch time) The page loaded with "More Stories" are the next twenty entries of everything which existed prior to the last post on the previous page. What makes this information useful is if you'd like to skip ahead several ticks — which would be like pages if pages were fixed — all you would need to do is decrease the startTime number taking it closer to the epoch. 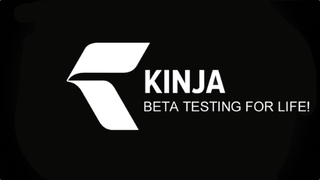 As a scale, I'll offer that to get to my earliest Kinja posts, you could use a startTime of 1364832161926 (12/2012-3/2013) on my personal Kinja and right now, if you were to hit the "More Stories" on Hackerspace, you get a startTime of 1390229737882 (prior to 1/20/14). Unless you're looking for something from the ObservationDeck beta or early Kinja OppositeLock, or something more recent than 1/20/2014 09:55:37 (EST), you can pretty much stay within that range (1390229737882 to 1364832161926) for the communities, while the date/times for the ad-supported blogs go back to when they began. It might also be useful to bookmark the above epoch converter or one of your own. Though its output isn't in milliseconds, if you are seeking a post from or prior to a specific date, you could run it through the converter and stick three random digits onto the end. For example, here's a link to what existed on Lifehacker prior to midnight, 2/2/2005 (launch day was 1/31) and here's one to the day A.J. Daulerio guest-edited Jezebel. Edited to Add: It should also be noted that having a startTime also works with tags. Though there is an (auto-inserted) forward-slash in straight URLs which will messes-up the output for tags. As an example, here's Jalopnik's coverage of Ford on the day GM filed for bankruptcy. Also, if you'd like to run this over your own profile and you have comments hidden, you can use the "my posts" tab on your private view. It also doesn't need the forward-slash. Note: This post was edited to add hints and to correct language. Update (6/2014): I've changed my epoch converter bookmark to one different than was originally suggested. Though both are functional, I like the new one better.